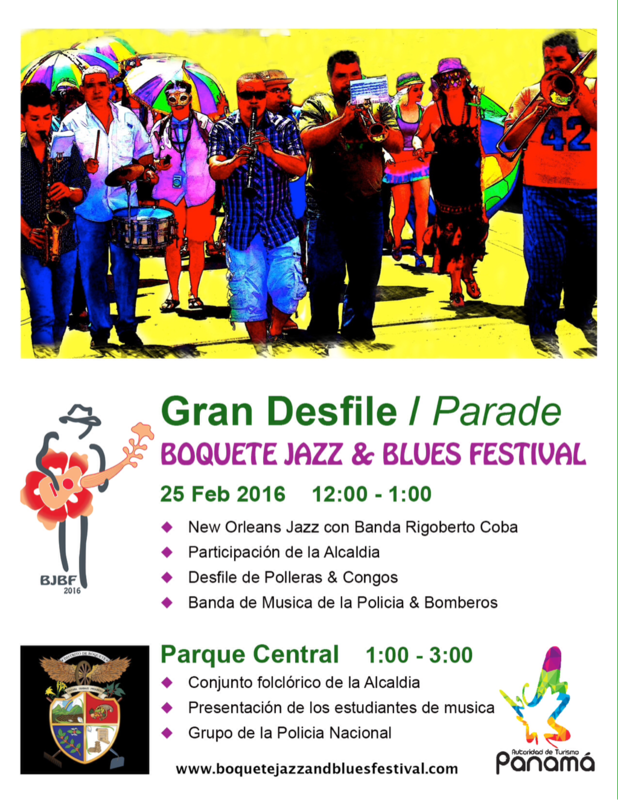 The traditional New Orleans-style BJBF street parade - not to be missed! The BJBF street parade has opened the annual festival since 4 years. Always on the Thursday of the festival week the parade has always been a fantastic and very colorful event. This year it will be even more so since we'll have Panamanian Pollera and Congo dancers joining the parade as well as a group of stilt walkers,the local police with a marching band, and also the bomberos, our local figher fighting squadron, also with a band. In addition there will be a group of Panamanian 'cowboys' on horseback adding a taste of Panamanian cabalgata, a traditional Panamanian horse parade. The event is strongly supported by the city of Boquete and by the Panamanian Tourist Authority. Be there on Thursday, February 25 at 12pm and join the fun!